High Summer is a perfect opportunity to retreat. To create time and space to rest, heal and nurture our body, mind and soul. By giving ourselves permission to totally be who we are so our soul shines through and we tap into our own unique and at the same time universal flow of life. Sometimes we have to stretch ourself to break free from stubborn patterns, we need mirrors to see ourselves in others, we need healing rituals to travel into our unconscious where our inner wisdom lies deep within. The way we will do this is to provide a safe space in which Michaela van der Meer and Rimke Pepers will collaborate to create a healing field of possibilities. 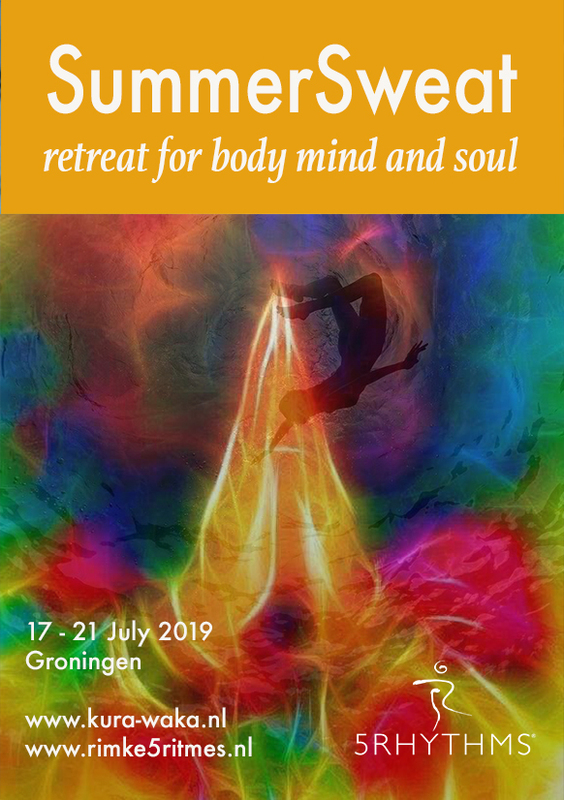 In this 5 day journey we will explore the 5Rhythms and the 5 elements by grounding ourself in the clay of Groningen, the fire of the sweatlogde, the water of the North Sea, the air that we breath and the Spirit that connects us all. We will be teaching in Dutch and/or English. Rimke is an accredited 5Rhythms teacher since 2014. Passionate about the dance and loves to share the practice in a grounded and lyrical way. Dance has been around forever; a way to travel up and down. The 5Rhythms Waves will guide and move us during this journey. Michaela runs sweat lodges, vision quests and deep body healing workshops and sessions. Nature is her greatest teacher. She lives and manifests her dream in Kura Waka in contact with her passion and all the wisdom she received from various indigenous medicine people and loves to share this wisdom. Dance alone to discover who you are. Dance with others to see who you are with. Dance in a group to discover your place.